Mystery Solved: Why Do NASA Space Shuttles Look So Dirty? At NASA's Kennedy Space Center in Florida, shuttle Discovery pauses for photos during its move called "rollover" from Orbiter Processing Facility-3 to the nearby Vehicle Assembly Building (VAB) on Sept. 9, 2010. This story was updated on Wednesday, Feb. 23. They're big and fast and fly in space, but NASA's space shuttles are far from being shiny white spaceships straight off the factory floor. Case in point: Space shuttle Discovery, which wears its age with pride as it nears retirement. Discovery is NASA's oldest flying space shuttleand the most-flown of the agency's three-orbiter fleet. It is poised to blast off from Florida on Feb. 24 to make one last delivery to the International Space Station before being retired this year along with the rest of NASA's shuttle program. But after nearly 27 years of spaceflight (Discovery first launched in August 1984), the shuttle shows its age. Its white and black exterior is marred with black streaks, and some SPACE.com readers have wondered why NASA's shuttles - a longtime symbol of American spaceflight – look old and busted. It turns out, there's a reason. "She does look worn, and she is," explained Stephanie Stilson, who oversees work on Discovery for each flight. "She's had a very long history." Discovery and other shuttles earn their weathering mainly from the searing heat of re-entry through Earth's atmosphere, when they are subjected to scorching hot temperatures of up to 3,000 degrees Fahrenheit (1,650 degrees Celsius). This upcoming trip to the space station will be Discovery's 39th spaceflight. It's NASA's 133rd shuttle mission. NASA's first two shuttles, Columbia and Challenger, were older than Discovery, but both were lost in spaceflight tragedies. Space shuttle Discovery stands bathed in light ahead of its last launch into space on Feb. 24, 2011 on NASA's STS-133 mission. While NASA engineers routinely inspect each shuttle for dings and damage after each flight, they only replace equipment that really needs it. That means insulation blankets, tiles and other gear – even if they look dirty or worn – stays on the ship if they can still do their job, Stilson told SPACE.com. "So if the blankets, the white part that you see, look dirty, they've been to space and back for goodness sake," Stilson said. "So they are dirty, but they're still in good shape and in good condition and we're not going to change anything out unless they need to be." The heat-resistant carbon composite panels along Discovery's wings and the black ceramic tiles on its underbelly are also subject to age. Older tiles on Discovery look streaked from the plasma environment of re-entry. They stand out in photos because new tiles still appear a pristine dark black. "So you can definitely tell that she's worked hard over the years, but that's just the nature of the business and what she's been through," Stilson said of Discovery. NASA has two final shuttle missions scheduled and is hoping for final funding approval from Congress for one extra flight, before retiring its three orbiters this year. The shuttles (Discovery, Atlantis and Endeavour) are being retired to make way for a new space plan aimed at sending astronauts to asteroid by 2025 and ultimately onto Mars. Discovery's final mission is called STS-133. It will deliver a storage room and the humanoid robot helper Robonaut 2 to the International Space Station during its 11-day spaceflight. Endeavour is launch on its final flight on April 19, with the potential extra shuttle flight slated for no earlier than June 28. Stilson said she was impressed that SPACE.com readers commented on Discovery's worn appearance because it is not something that will be overlooked when the shuttle is ultimately displayed in a museum. "I'm glad they noticed that because when they see Discovery at the display site, they'll see that as well," she said. NASA ultimate plans to send its space shuttles to museums for exhibit across the country. 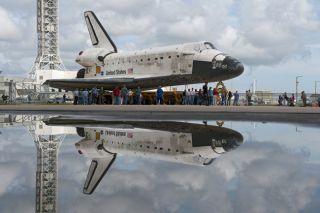 The final destinations for the entire shuttle fleet have not yet been decided, NASA officials have said. SPACE.com is providing complete coverage of the last voyage of space shuttle Discovery. You can follow SPACE.com staff writer Denise Chow on Twitter @denisechow as she covers Discovery's final space voyage from Cape Canaveral, Fla.